Awful nights sleep. Probably about the worst I’ve had on this trail. Just as I was settling down. The wind kicked up. I was lying in my tent and it was catching it and tossing it sideways. I was having flashbacks to my Glacier Peak trip this last summer…except this time I’d be inside the tent as it blew away. And the sand. The fine sand would blow in through the mesh. Everything was covered in a thin blanket of it this morning and no matter how much you shake the tent, you just can’t get it all out. I took a bit of a slower time getting ready this morning as I shook the sand out of everything. It was also pretty chilly which always makes it a bit harder to want to move. The temps dropped into the 30s last night, which meant that I cuddled with my sawyer and my electronics in my sleeping bag. I’m taking no chances with things freezing again! 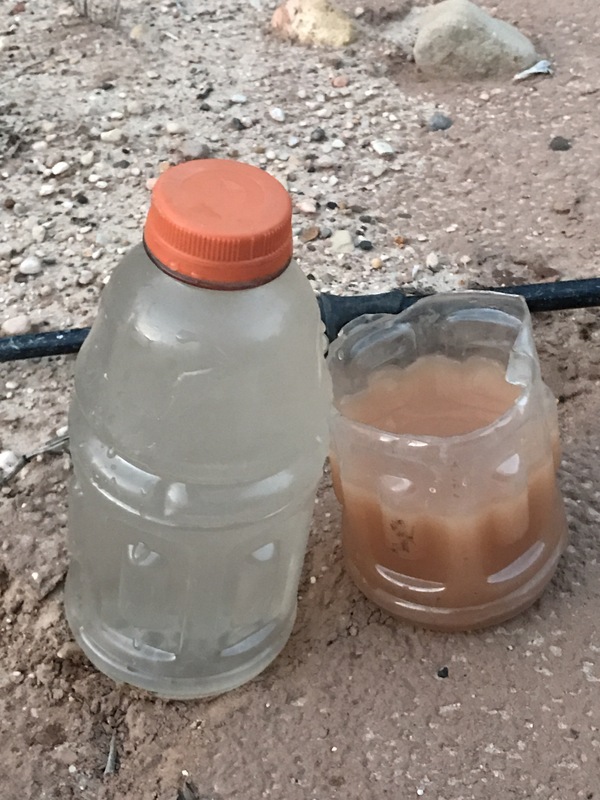 I also gave the sawyer- really any filter I’ve ever used- its biggest test trying to get a quart of water out of silty Sheep Creek. It passed with flying colors!! Before on the right, after on the left. The magic of the filter. 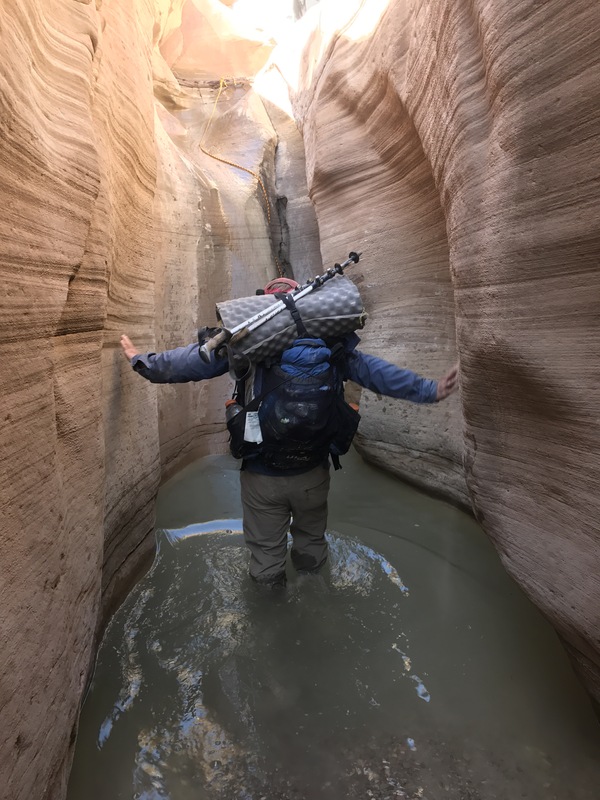 I wandered up Sheep Creek for a bit, trying to keep my feet as dry as possible, before coming to the junction with Bull Valley Gorge. What to do…take the dark and narrow path to the left or the bright and open path to the right…. 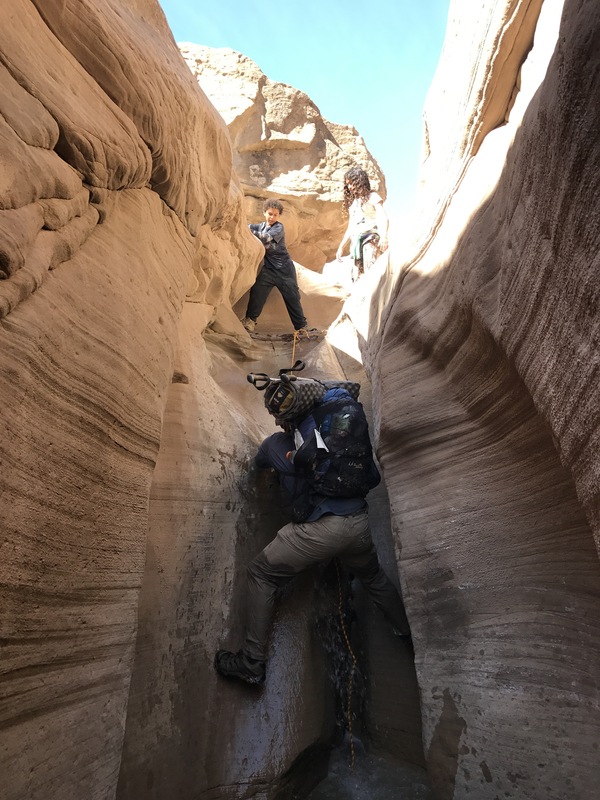 This is an alternate route through a slot canyon suggested and highly recommended by Li Branfours. When I planned my route for today I noticed that a few of the alternates could be looped in together with the guidebook route. The route would be more miles, but I’ve got the time! It’s really nifty when stuff like that is possible so I gave myself a winding route just because. I’m so glad of it and feel so lucky that I can see so much of this area. The first few miles up canyon were pleasant mostly punctuated for me by the reappearance of the ponderosa again. I’ve loved seeing some tall trees in these unexpected places! Finally about 3 miles in the Canyon narrowed considerably and then slotted up. It got pretty narrow at times. The narrowest spot I think I’ve been through. I was climbing up the canyon, instead of down like in Round Valley Draw, so I’d have to scramble up and over some rock fall occasionally. This got tricky because of all the extra mud I was carrying on my shoes. 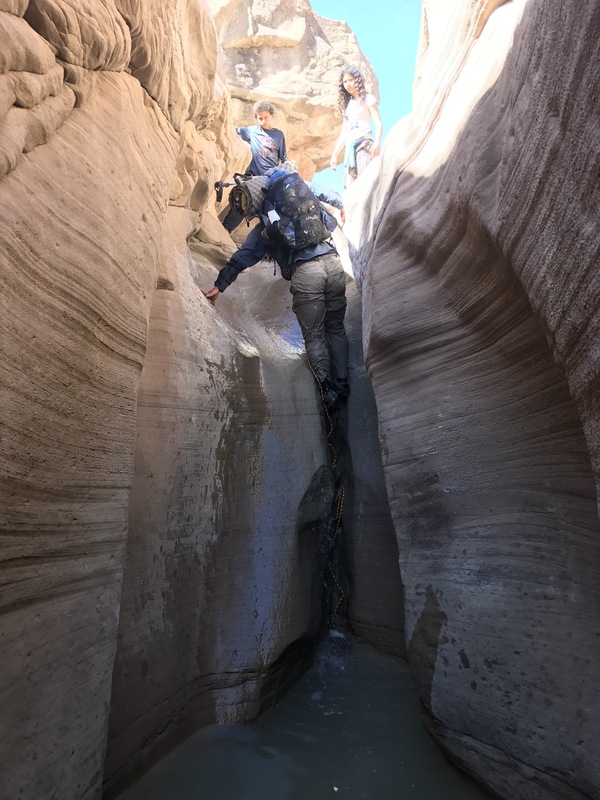 The canyon floor wasn’t too bad, but one muddy step is all it takes to lose friction on your shoes as you try to climb. I kept going, finding a spot where someone had bolted a climbing rope to the wall to help get up. I was super thankful it was there! I heard some echos up canyon and around a bend was met by a father and two teenagers from Sacramento. We were just about to pass under the Skutumpah road above and they told me to take a close look as I passed under. There was an old pickup stuck in the canyon walls! Sure enough as I passed under the road- which isn’t really a bridge of any sort, just an earth and log fill- I looked up and saw the crushed pickup, suspended about 100 feet off the canyon floor and about 50 feet below the rim. 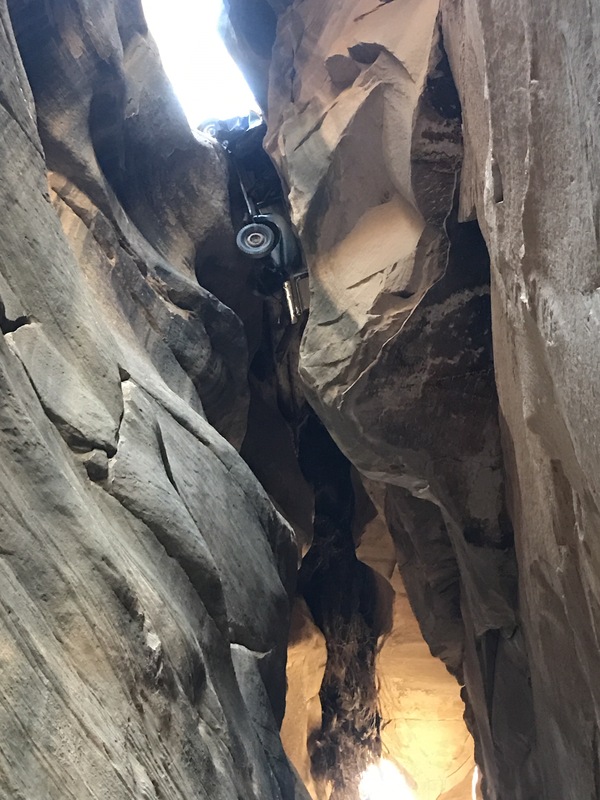 Crushed truck suspended 100 feet above the canyon floor. It had stalled on the road above sometime in the 1950s and careened backwards into the slot. All three passengers were killed. The road was widened after the accident by pushing more earth and logs down into the crack. An eerie sight. From here the travel up canyon slowed considerably. 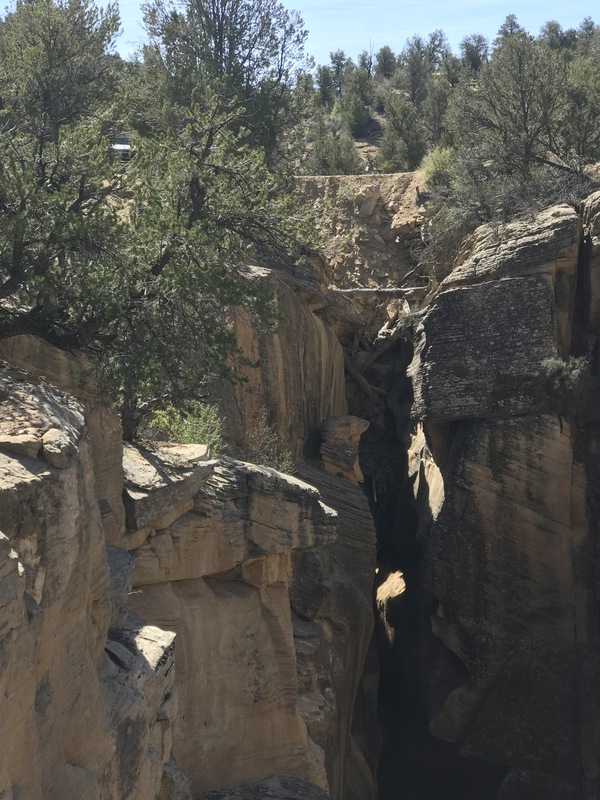 There had been a few easily avoidable potholes down canyon, but I suddenly started hearing rushing water and around a corner there was a stream flowing down the center of the canyon. So much for dry feet. The map had mentioned there might be some slippery pouroffs to navigate, but I didn’t think it was because there would be water actively falling over them! I had to climb up at least two of these waterfalls before arriving at a pool of unknown depth with another waterfall and rope leading out of it. I wasn’t quite sure what to do, and started prepping my things to keep them dry when the dad and teens came back up behind me. They were actually the ones who placed this rope! Half way up and getting a little soaked. The rim walk back to the road was pleasant and super fun to look down on the canyon below where I had just been. I’m still amazed by the road over the canyon. It looks so unstable! And there’s no guard rail to speak of. Skutumpah Road over the canyon. The glint of the trucks chrome is just barely visible in the shadows. I stopped for early lunch at the trailhead but didn’t linger too long as a group of seven OHVs with college age bro-y guy/girl pairs in each one pulled up to the trailhead and started chucking rocks into the canyon. Not really the scene I wanted (and glad I was up top) I moved on down the road for a few miles until I hit the Willis Creek trailhead. This is where I reintersected with the main guidebook route which I then hiked “backwards” back to its confluence with Sheep Creek. 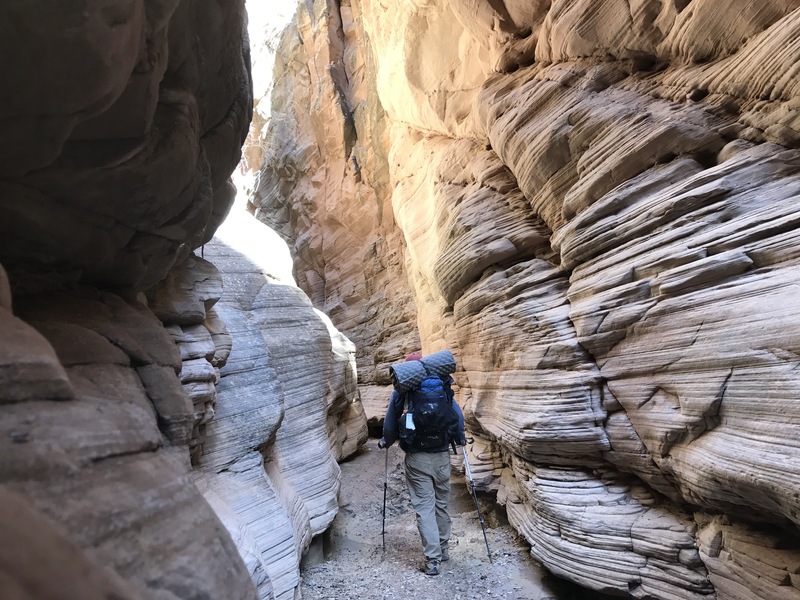 Willis Creek is another beautiful Narrows section, and seems to be pretty popular. There’s a creek that runs down the center and it’s pretty flat, so none of the crazy drop offs like in Round Valley or Bull Creek. 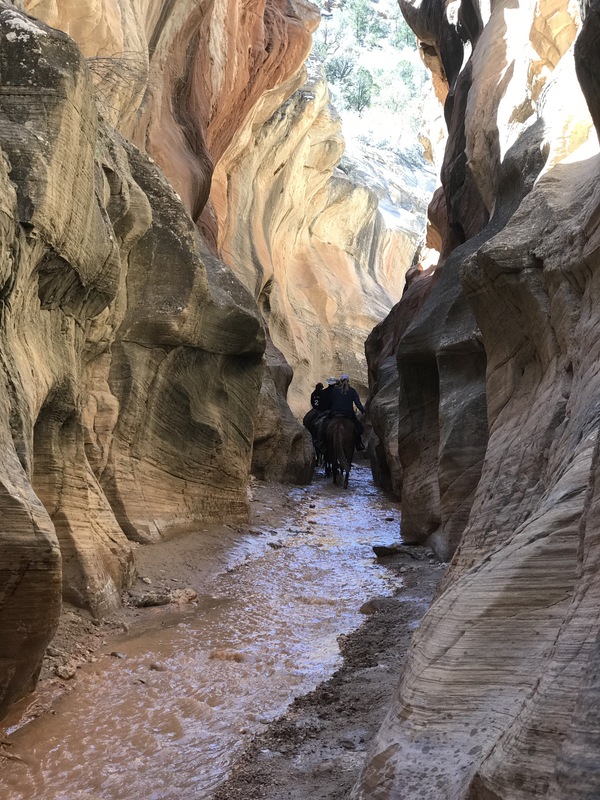 I ran into 12 day hikers and a group of 10 equestrians in the canyon that alternated between nice slots and more “open” sections. I’m still amazed at how many people I’ve seen these last two days, but I guess that’s what happens where you’re closer to the road systems. Of course I ran into the horse train at the most narrow point in the slot. 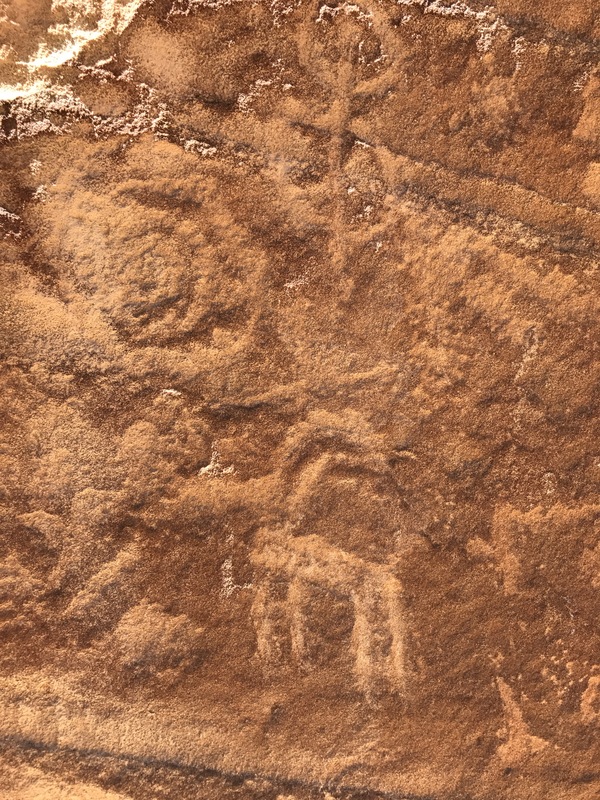 When I got down to the Sheep Creek confluence (only 4 miles upstream from where I started my day) I took a short side detour to check out some petroglyphs. 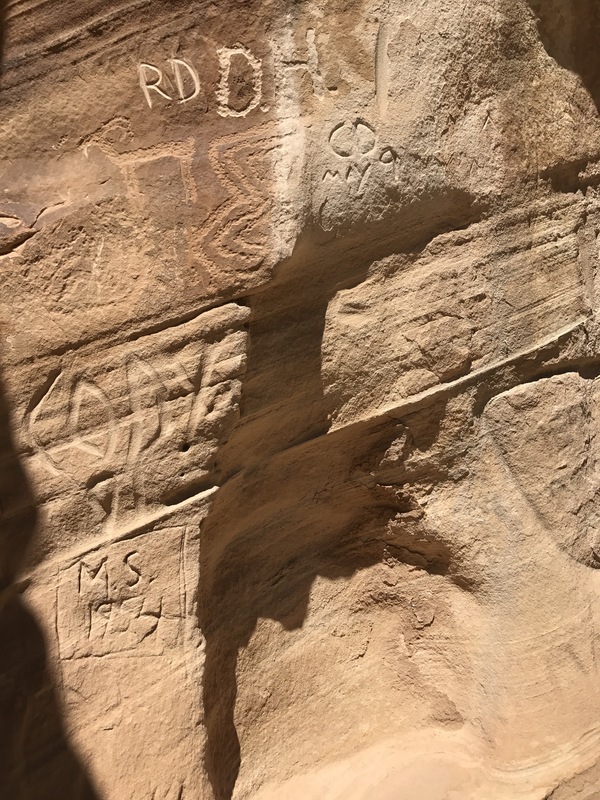 There were a mixture between ancient native ones, “cowboyglyphs” and more modern tourist graffiti from the last 20 years, which was disheartening. Some of the early euro-American ones bore the same last names as the folks in the Paria Cemetary, which I found interesting. I signed the hiker logbook and, like yesterday, found myself sitting and looking at the wall for a long time wondering about each of the different artists (and graffiti-ists) through the ages who have added their information to the panel. Finally pulling myself up I was back up Sheep Creek for 2 miles to where I reconnected with the Skutumpah Road which reconnected with the Cottonwood Creek Road which brought me into Bryce Valley and Cannonville. Complete change of scenery. I was passing houses and farms and ranches- again some baring the same last names of the families in the Paria Cemetary. 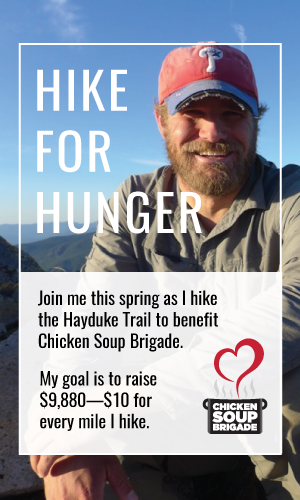 I turned down two unsolicited rides into town, before a pickup pulled over heading the other direction and the guy said out the window, “You’re a Hayduker, aren’t ya. I can just tell by that slightly haggard look you have.” We chatted for a bit. His name was Roy and he’s been running a small ranch down the road since ’98 and has met a number of Haydukers over the past few years. He’s very impressed with the fortitude it takes to do the hike, wished me well and then was off. 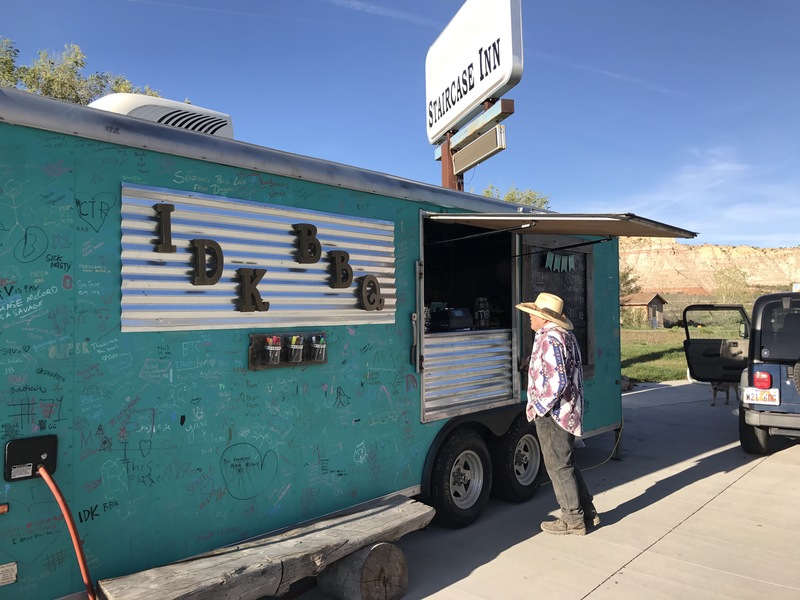 I got to town around 4:00, made a quick stop st the Grand Staircase-Escalante national Monument visitor Centre before heading to my my all in one hotel/gas station/convenience store with a BBQ food truck around back as the only restaurant in town. I had double dinner here- the only eatery in town. I checked in, and that was about that. I felt very unmotivated to do much of anything. The soles of my feet are pretty sore. All of my socks have worn pretty huge holes in them now, and I’m hoping to buy some more in a Tropic tomorrow. In addition to Roy the BBQ guy and attendant at the front desk mentioned that I looked kind of beat. I guess it’s good that I have another light day scheduled for tomorrow. Surprisingly this is the best room I’ve stayed in by far on trail. Looking forward to hopefully a good nights sleep. Then a super short day to Tropic tomorrow for another almost day off. Oh my goodness! So I had to go back through my photos because I totally didn’t recognize the spot with the rope in your photo. When we went through there was a) no water flowing down that drop and b) no rope because there was a big ol’ log situated vertically in that slot that we could easily climb up. Amazing how different things can be! Also, great photo of the truck!! Glad you got a chance to rest up in Cannonville! My hiking buddy Greg and I drove from Grand Junction (CO) to Willis Creek on Saturday, April 22. We drove in from the west (Bryce), so we passed you in Tropic on Saturday, probably? (We didn’t get there until about 3:00 pm). I noticed the horse tracks in Willis Creek, which you saw on Friday. 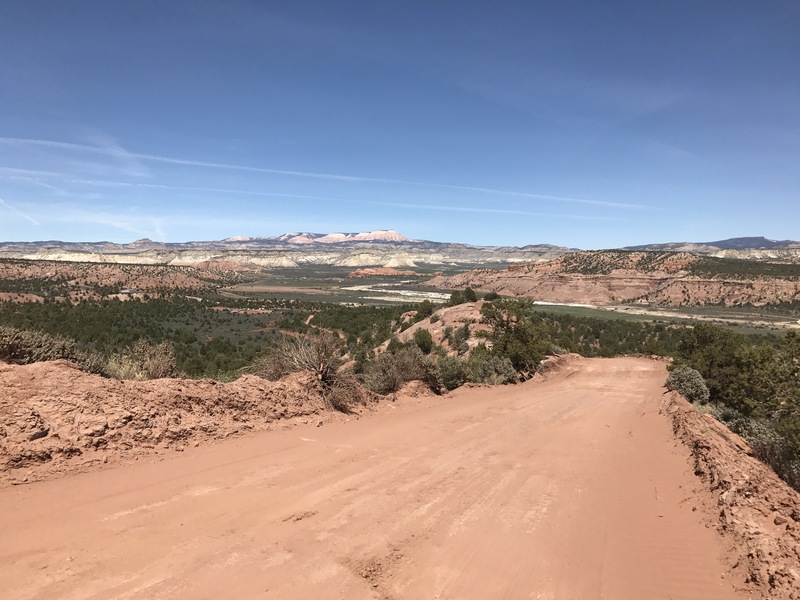 We camped at the Willis Creek parking lot–the only day without wind! 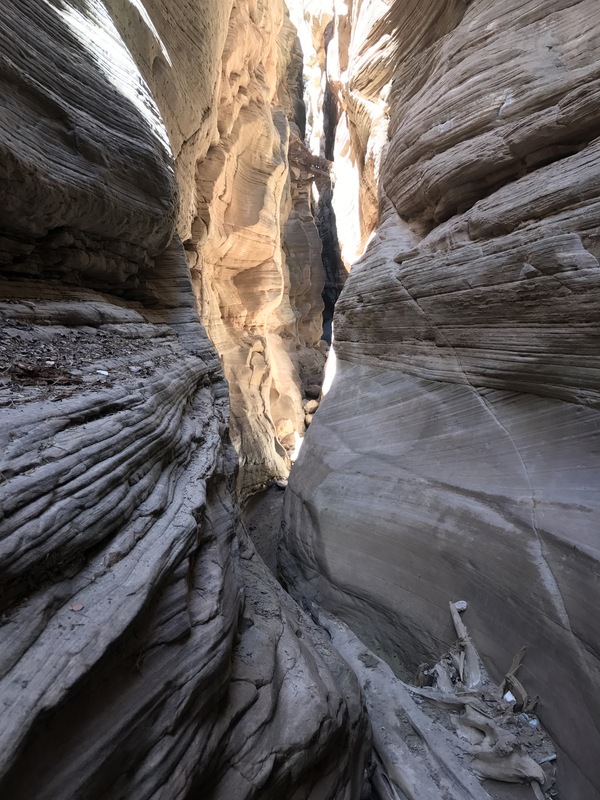 On Saturday we went to Escalante and backpacked from town to Hwy 12, which is 15 miles of awesome canyon scenery (but you already know a bit about canyons, eh). 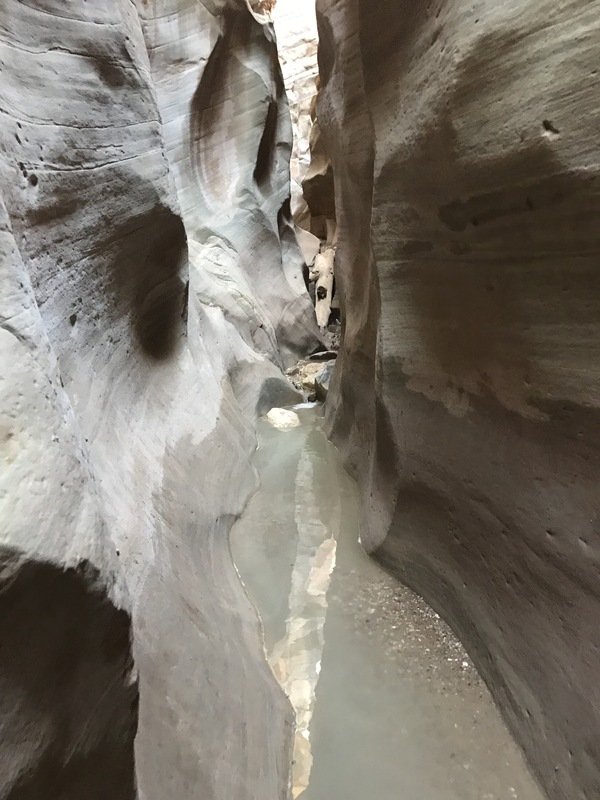 We also explored Peek-A-Boo slot and Upper Calf Creek Falls. So much to see (for those of us who don’t have two months)! Last year, we spent 5 days in Coyote Gulch, just a week after Drop N Roll went through (in five hours!). You probably did pass me in town! That sounds like a great trip Kurt! 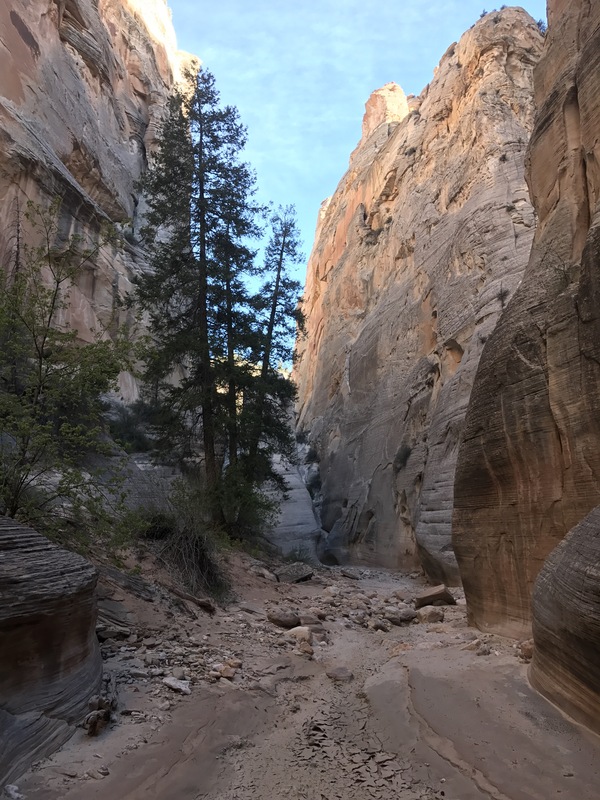 The photos of Upper Calf Creek Falls I’ve seen in postcards look fantastic. I’m glad to hear you had a great time. Daybreaker! We stopped at the Cannonville visitor center this afternoon. I picked up a guide to the rock art. Happy to share when we cross paths!